Chamomile or camomile is the common name for members of several related plant species in the sunflower or daisy family (Asteraceae), and in particular the annual herb Matricaria recutita (German chamomile) and the perennial herb Anthemis nobile (Roman chamomile, also classified as Chamaemelum nobile). The term also is used to refer to the dried flower heads of either of these later two plants, which is used to prepare a tea or provide an essential oil used for flavoring and perfume. Other plants commonly referred to as chamomile include Matricaria matricarioides (wild chamomile or pineapple weed) and a number of other species in the genus Anthemis, such as Anthemis cotula (stinking chamomile or dog-fennel) and Anthemis tinctora (yellow chamomile, or golden marquerite, or Dyer's chamomile). However, the Roman chamomile and the German chamomile have been called "true chamomile" because of their similar appearance and popular medicinal use (Longe 2005). 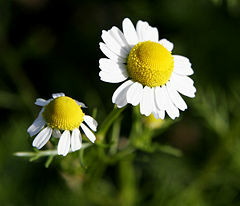 German chamomile is the official medicinal chamomile (Longe 2005). 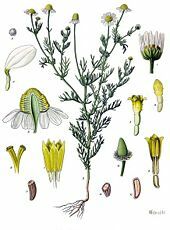 The flowers and leaves of chamomile provides a large number of values beyond the plant's own reproduction and survival, including medicinal, cosmetic, agricultural, and ornamental. Chamomile is used to treat a wide variety of health problems, dyes from some species are used to lighten hair color, and chamomile fragrance is added to shampoos. Chamomile also is used to help the growth and health of other plants and is planted for its beauty and fragrance. The various species known as chamomile belong to the family Asteraceae. Asteraceae is known as the aster, daisy, or sunflower family. It is a taxon of dicotyledonous flowering plants. The family name is derived from the genus Aster and refers to the star-shaped flower head of its members, epitomized well by the daisy. In addition to the sunflower and daisy, other well-known members of the family include lettuce, chicory, globe artichoke, safflower, chrysanthemums, ragwort, and dandelion. The most common characteristic of all these plants is an inflorescence or flower head; a densely packed cluster of many small, individual flowers, usually called florets (meaning "small flowers"). Plants in the family Asteraceae typically have one or both of two kinds of florets. The outer perimeter of a flower head like that of a sunflower is composed of florets possessing a long strap-like petal, termed a ligule; these are the ray florets. The inner portion of the flower head (or disc) is composed of small flowers with tubular corollas; these are the disc florets. Chamomile is commonly considered to be either Anthemis nobile, known as Roman chamomile, and Matricaria recutita, known as German chamomile. These are both found in Europe, with Roman chamomile also common in the Mediterranean region and German chamomile common in Asia. Chamomile has been a traditional medicinal herb in western Europe, western Asia, and India (Longe 2005). However, the genus Anthemis includes many members known as chamomile. The name chamomile comes from the Greek khamai "on the ground") and melon ("apple) (Longe 2005). 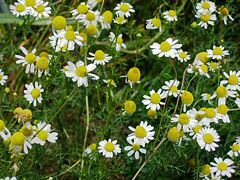 The ancient Saxons revered chamomile as one of nine sacred herbs and the Egyptians dedicated chamomile to their sun God, Ra, and prized the herb as a cure for malaria (Longe 2005). German chamomile (Matricaria recutita), is an annual plant of the Asteraceae family. Synonyms include Chamomilla chamomilla, Chamomilla recutita (accepted name according to the Flora Europaea), Matricaria chamomilla, and Matricaria suaveolens. Other common names include wild chamomile, Hungarian chamomile, and scented mayweed. It also is known as Balder's eyelashes, after the Norse God of Light, Balder (Longe 2005). German chamomile usually grows near populated areas all over Europe and temperate Asia. It has long been grown in Germany for its medicinal properties (Longe 2005). It is widely introduced in temperate North America and Australia. As the seeds need open soil to survive, it often grows near roads, around landfills, and in cultivated fields as a weed. The branched stem of German chamomile is erect and smooth and grows to a height of 15-60 centimeters. The long and narrow leaves are bipinnate or tripinnate. German chamomile has a blossom that is bright gold (yellow) and ringed with numerous white rays (Longe 2005). The flowers are borne in paniculate capitula. The white ray florets are furnished with a ligule, while the disc florets are yellow. The hollow receptacle is swollen and lacks scales. This property distinguished German chamomile from corn chamomile (Anthemis arvensis), which has a receptacle with scales. The flowers have a strong, aromatic smell, and bloom in early to mid summer. Anthemis nobilis, commonly known as Roman camomile, garden camomile, ground apple, low chamomile, or whig plant, is a low, hardy growing, European perennial plant found in dry fields and around gardens and cultivated grounds. It also is sometimes called lawn chamomile because of the creeping roots and compact, mat-like growth (Longe 2005). Scientifically, it is also known as Chamaemelum nobile. The stem of Anthemis nobilis is procumbent and the leaves alternate, bipinnate, finely dissected, and downy to glabrous. The leaves have a feathery appearance and are light green and somewhat shiny (Longe 2005). The solitary, terminal flowerheads, rising eight to twelve inches above the ground, consist of prominent yellow disk flowers and silver-white ray flowers. The flowering time is June and July, and its fragrance is sweet, crisp, fruity, and herbaceous. It is said that Roman chamomile offers a pleasant, apple scent when walked upon (Longe 2005). In Spanish, it is known as manzanilla, or "little apple," and in the Middle Ages it was used to scent the floors and passageways in the home (Longe 2005). Chamomile is used medicinally, cosmetically, agriculturally, and as an ornamental plant. The flower heads and leaves of both German chamomile and Roman chamomile are used medicinally. They are both highly scented with an aromatic oil; the heat-sensitive Azulene is the blue chamomile essential oil (Longe 2005). The active ingredients are essential oils, notably chamazulene, flavonoids, and coumarin. The primary active ingredient of the essential oil from German Chamomile is bisabolol. Other phytochemical constituents include plant acids, fatty acids, choline, tannin, cyanogenic glycosides, and salicylate derivatives (Longe 2005). Chamomile is used medicinally against sore stomach, irritable bowel syndrome, and as a gentle sleep aid (as a sedative). It is used as a tonic, anti-inflammatory, antibacterial, and anti-allergenic (Longe 2005). A mild infusion of the herb has been used traditionally to calm restless children and to ease teething pain and cholic in babies (Longe 2005). Its carminative properties have been used to relieve intestinal gas and to help in cases of diarrhea, constipation, and peptic ulcers; it also has been used to relieve headaches and fevers and treat arthritis (Longe 2005). It is also used as a mouthwash against oral mucositis. It has acaricidal properties against certain mites, such as Psoroptes cuniculi. Medicinally, chamomile can be taken as an herbal tea, or taken externally to brighten the hair (Longe 2005). For home gardeners, chamomile tea may be made from an infusion of blossoms and an extract of essential oil can be prepared by placing fresh blossoms in a glass container and covering the plant with olive oil in a sunny location for about one week (Longe 2005). A strong preparation, useful for a skin or hair wash or to bathe wounds, may be made by letting plant parts steep in a covered nonmetallic pot for at least ten minutes (Longe 2005). Chamomile also is popular in aromatherapy, whose practitioners believe it to be a calming agent to end stress and aid in sleep. Chamomile is used cosmetically, primarily to make a rinse for blonde hair. The flowers also are used to provide a fragrance for shampoos and other hair preparations (Herbst 2001). 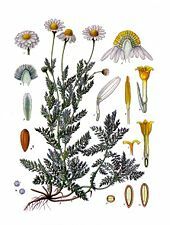 Dyer's chamomile or yellow chamomile, Anthemis tinctora, lacks the medicinal properties of German and Roman chamomile and is valued mainly as a dye plant, providing a distinctive dye that ranges from a bright yellow to a more brownish-yellow tint (Longe 2005). Agriculturally, chamomile is sometimes known as "the plant doctor," because it is thought to help the growth and health of many other plants, especially ones that produce essential oils. It is thought to increase production of those oils, making certain herbs, like mints (spearmint, sage, oregano) and basil taste stronger in scent and flavor. Chamomile "tea" is also thought to be useful to suppress fungal growth, for example misting it over seedlings may prevent damping off. Chamomile is frequently an invasive species in agricultural fields. Farmers often must control chamomile's spread to maintain productivity of their fields. The chamomile is mentioned in Shakespeare's Henry IV, part 1 "The Camomile; The more it is trodden on, the faster it grows." Howard, M. 1987. Traditional Folk Remedies. London: Century. Judd, W. S., C. S. Campbell, E. A. Kellogg, and P. F. Stevens. 1999. Plant Systematics: A Phylogenetic Approach. Sinauer Associates, Sunderland, MA. ISBN 0878934049. Longe, J.L. The Gale Encyclopedia of Alternative Medicine. Farmington Hills, MI: Thomson/Gale. 2005. This page was last modified on 2 April 2008, at 04:24.